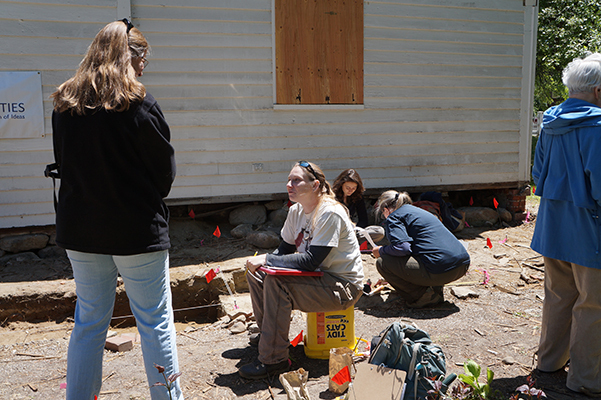 The Parsons House Archaeological Project had its first public day today and we were buzzing with activity. In addition to excavation, we had typical 18th and 19th-century games and toys available for children of all ages. Kerry Lynch from UMass Archaeological Services and Evan Taylor from the UMass Anthropology Department kindly volunteered their time to help dig. Kathy, Gabe, Lexie and Jen came by to volunteer in the lab to help with the processing of artifacts. Everyone did an awesome job. Thank you very much! 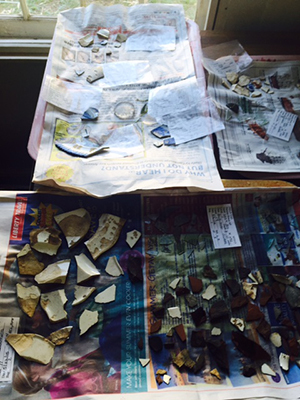 Everything that project excavators take out of the ground is initially stored in paper bags. Our job in the lab is to sort, clean and document all of that mixed material. This is labor intensive work as it sometimes involves the separation of very small artifacts for example, tiny fragments of animal bone or glass. Most of the artifacts are gently cleaned by dry brushing with a toothbrush to remove soil. Glass and ceramics are usually washed. Everything is carefully documented to record where and when it was found. Jill talks with one of the site visitors. All artifacts are washed and sorted in the lab.